What does Dancing with the Stars' hoofer Julianne Hough have to do with science, science fiction, or fantasy? Other than looking like a young Red Queen off to a night of debauchery at Studio 54, she's sporting Swarovski's entry for this year's The Heart Truth, the red dress runway show at the Mercedes-Benz Fashion Week in New York. The event's aim is to raise awareness for women's heart health. * Pain or discomfort in the center of the chest. * Pain or discomfort in other areas of the upper body, including the arms, back, neck, jaw, or stomach. * Shortness of breath, breaking out in a cold sweat, nausea, or light-headedness. I wish I had known what to be aware of when my mother almost died from a massive heart attack two years ago. Ever since then, I've tried to help raise awareness by educating friends about common signs of an attack and showing my support by wearing a red heart during February. 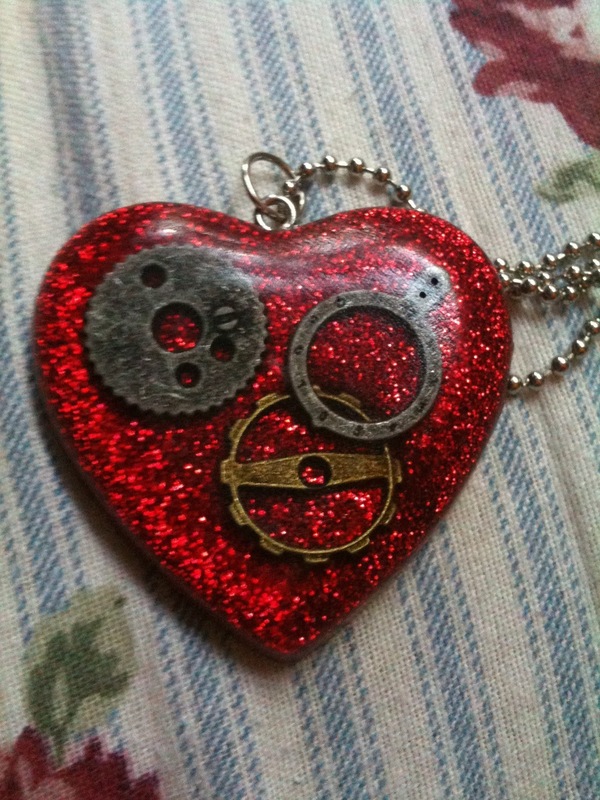 This year, I'm sporting a steampunk inspired pendant I found on Etsy. I'm such a sucker for sparkle. The heart was handmade by wonkymonkey in Illinois. So, please do all the women in your life a favor. Familiarize yourself with the signs of heart attacks in women and wear something red this month to show your support. Who knew that wearing a red shirt could actually save a life? Oh and thanks to GoFugYourself for the fug-and-fab red dress run down!